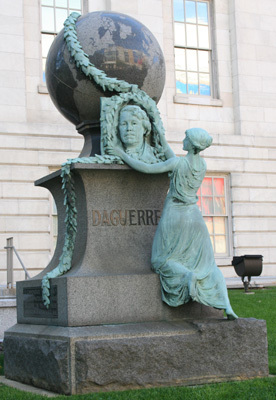 A statue for Louis Jacque Daguerre, for whom the daguerreotype is named, was first proposed in January 1890 by the Photographer Association of America. 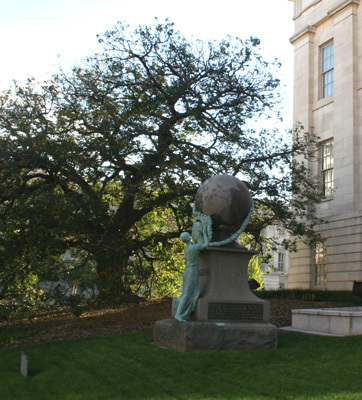 The Association requested the memorial be erected in the National Museum of the Smithsonian Institute and permission was given by then Smithsonian Secretary Samuel P. Langley. The sculpture was unveiled in August 1890 at the eleventh annual convention of the Photographers’ Association of America, during their meeting in Washington, D.C. 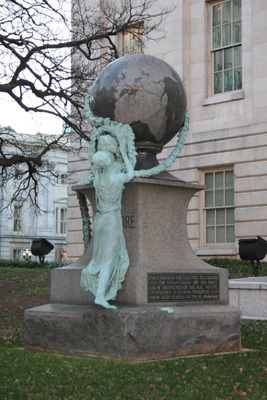 The sculpture was placed in the rotunda of the National Museum (today called the Arts and Industries Building). At the time of the unveiling, the sculpture and the sculptor had not been fully paid for. The Photographers’ Association and the Daguerre memorial fund eventually came up with the monies needed by collecting subscriptions. 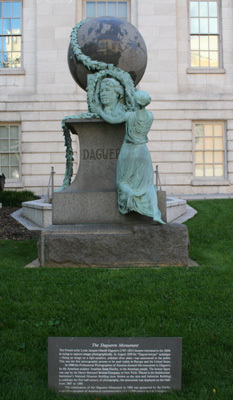 In 1897 changes were made at the National Museum for the creation of more gallery space, and the Daguerre memorial was moved to the grounds outside the museum. Eventually, in 1969, with the construction of the Hirshhorn Building, the Daguerre statue was placed in storage. In honor of the 150th anniversary of photography the Daguerre statue was relocated and rededicated at the plaza between the National Portrait Gallery and the National Museum of American Art on Seventh Street NW between F and G streets.